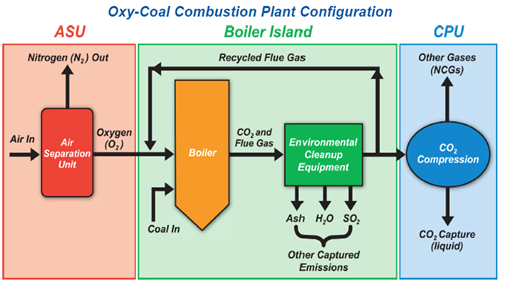 Oxy-combustion burns coal with a mixture of oxygen and CO2 instead of air to produce a concentrated CO2 stream for safe, permanent storage. In addition, the FutureGen 2.0 plant’s new boiler, air separation unit, CO2 purification and compression unit will deliver 90 percent CO2 capture and take other emissions, such as SOx, NOx, and other emissions, to near-zero levels. The technologies involved in CCS stand at various stages of commercial readiness. Integrated projects that capture and store a large volume of CO2are being deployed in only a few instances, and so far, not in any baseload power plant. CO2 capture refers to the separation of CO2 from the other components in the flue gas or process stream of a power plant or an industrial facility. CO2 capture technologies have been applied at small scales to point sources of CO2, with the CO2 being used for various purposes, including the production of streams of CO2 for use to increase oil production via enhanced oil recovery (EOR) and for sale as a food-grade product for carbonating beverages. However, the technology is not deployed at the scale necessary to significantly reduce CO2 emissions. Amine - A corrosive derivative of ammonia that has a thirst for binding with CO2. Aqueous monoethanolamine (MEA), diglycolamine (DGA), diethanolamine (DEA), diisopropanolamine (DIPA) and methyldiethanolamine(MDEA) are widely used industrially for removing carbon dioxide (CO2) and hydrogen sulfide (H2S) from natural gas and refinery process streams. They may also be used to remove CO2 from combustion gases / flue gases and may have potential for abatement of greenhouse gases. Related processes are known as sweetening. Carbonic anhydrase - A bio-catalyst enzyme that ordinarily processes carbon dioxide produced in organisms. In E. coli it plays an essential role in metabolism. Separation of the carbon-dioxide stream from other gases and pollutants from industrial and power-plant flue stacks is usually energy intensive and therefore quite costly. CO2 Solution is using an enzyme based approach which does not require separation of carbon dioxide from other gases. The bioreactor is a long cylinder containing a packing material that acts as a solid support for the enzyme. The surface of this material has been chemically modified so that the enzymes attach securely. At the top of the cylinder, a water solution is pumped in and flows around the packing material, while gases from a smokestack enter the bottom of the cylinder and bubble up through the solution. The carbon dioxide is absorbed into the solution and then interacts with the enzymes, which convert the greenhouse gas into bicarbonate ions. To end the process, cleaned up air escapes from the top while the bicarbonate solution is extracted for further processing--either back into pure carbon dioxide for long-term geological storage or into a carbonate compound, such as limestone, that can be used by industry. CA - Customized carbonic anhydrase enzymes - Could catalyze carbon capture under industrial conditions. Data from Codexis shows that the performance of its engineered enzymes has been improved by about two million fold over natural forms of the enzyme. Its work is supported by a grant from the DoE's ARPA-E Recovery Act program and is jointly developed with CO2 Solution, Canada. Evolved CA enzymes are functional and stable in relatively inexpensive, energy efficient solvents for 24 hours at temperatures greater than 90 degrees C, the company said. Energy Penalty - The percentage of CO2 that is captured is not equal to the percentage of CO2 that is avoided through capture. For example, capture of 90 percent of the CO2 from a supercritical pulverized coal (SCPC) plant using current technologies would result in increased fuel consumption of 24-40 percent compared to similar plants without CO2 capture and compression A plant that emitted 1 million tons of CO2 per year prior to capture would generate 1.24–1.4 million tons of CO2 after the addition of capture equipment in order to generate the same amount of electricity. Assuming 90 percent of the CO2 captured, 1.12–1.26 million tons would be captured, an amount that exceeded the original amount of CO2 emissions from the uncontrolled plant. Under this scenario 124,000–140,000 tons of CO2 would still be emitted from the plant. The implication of the energy penalty from an emissions accounting perspective is that the captured emissions are not equal to the avoided CO2 emissions. 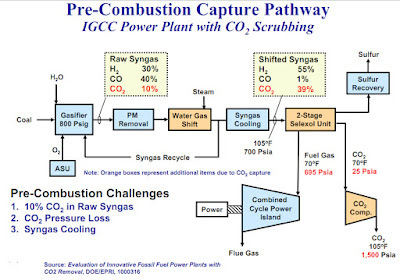 IGCC - Integrated Gasification Combined Cycle - A technology that turns coal into gas—synthesis gas (syngas). It then removes impurities from the coal gas before it is combusted and attempts to turn any pollutants into re-usable byproducts. This results in lower emissions of sulfur dioxide, particulates, and mercury. Excess heat from the primary combustion and generation is then passed to a steam cycle, similarly to a combined cycle gas turbine. This then also results in improved efficiency compared to conventional pulverized coal.involves turning the coal into a synthesis gas and removing undesirable components such as sulfur and CO2 before burning it to produce electricity. been built worldwide as of the end of 2007. 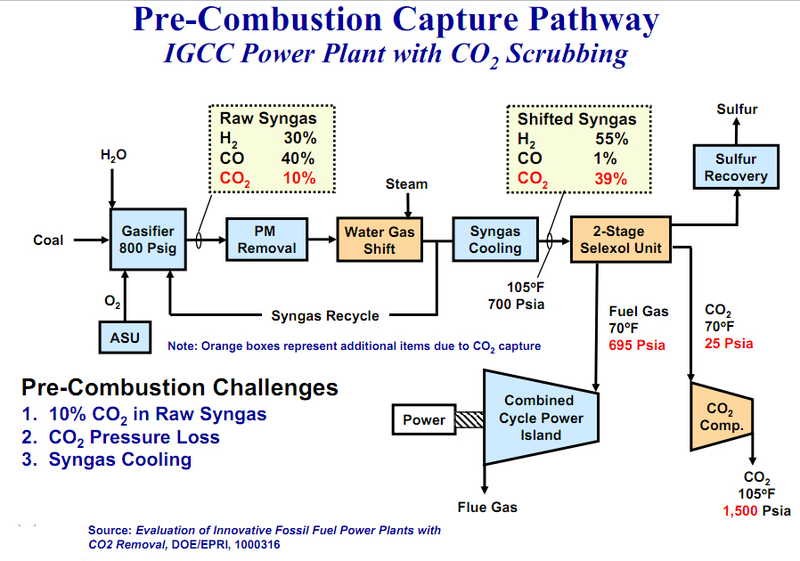 None of the existing IGCC plants have the technologies needed to capture the CO2. When CO2 is separated from the syngas (as in pre-combustion capture), a turbine that can function in a hydrogen-rich environment is needed. Hydrogen-fired turbines are being developed for this purpose, and have been demonstrated but are not at the same state of technological readiness as syngas-fired turbines. IL - Ionic Liquids - Salts that are liquid at room temperature which have high absorption potential and never evaporate. SO2 is highly soluble in ILs − 8 to 25 times more soluble than CO2 depending upon pressure. NETL researchers have proved that ILs can be used as the separating media in supported liquid membranes to separate CO2 from H2. capture involves the use of MEA to separate the CO2 from the flue gas stream. Not counting the significant initial start-up quantity of MEA, coal-fired facilities would have to replace the MEA at a rate of about 1.5 kilograms per metric ton of captured CO2. If 90 percent of the CO2 emitted in 2006 were captured, the entire existing U.S. coal fleet would require about 2.5 million metric tons of amines annually. In 2005, the annual worldwide demand for MEA was about 1.3 million metric tons. Deploying capture technologies will not be simple, even with a commercially mature approach like MEA. Membrane separation - The process for separating carbon dioxide from the flue gas using membrane/amine hybrids or enzymatic CO2 processes. Permeation of CO2 through polymeric membranes occurs where a constituent passes through the membrane by diffusion and sorption by the fluid on the other side of the membrane. The driving force is achieved either by pressure or by concentration difference across the membrane. operating temperature (400°C) of a polymer-based membrane. MOF - Metal Organic Framework - Massive, crystalline compounds consisting of metal ions or clusters coordinated to often rigid organic molecules to form one-, two-, or three-dimensional structures that can be porous. In some cases, the pores are stable to elimination of the guest molecules (often solvents) and can be used for the storage of gases such as hydrogen and carbon dioxide. Different species of MOFs may become the basis for hydrogen fuel tanks, drug-delivery devices and CO2 scrubbers. The laboratory of Omar Yaghi at the University of California, Los Angeles has created a new generation of MOFs that have close to the same storage capacity and preference for CO2 as amines do, while only weakly bonding with the molecule. To the naked eye, MOFs look "kind of like a rock," said Bo Wang, a researcher in Yaghi's lab. But at the molecular level, these seeming solids look like a massive series of circular cages, almost like a honeycomb or molecular sponge, he said. Amines, once they have chemically reacted with CO2, must be cooked at 120 degrees Celsius for one to two hours before they let go of their load. According to Wang, it takes two minutes at 60 degrees Celsius for 1 gram of the new MOFs to drop their CO2 and be ready for further use. The MOFs' secret is that their frameworks -- which are built out of metal ion clusters connected by organic links -- are easily modified. Yaghi's lab has made thousands of different versions of the molecules, testing to see which had the proper shape to selectively admit CO2. "The genius of the materials that Professor Yaghi has developed is their enormous capacity for CO2," said Joseph Hupp, a chemist at Northwestern University who has developed MOFs that separate CO2 from methane. Carbon dioxide has a moment where its electrons are not distributed evenly among the molecule, called its quadropole moment, Hupp said. This signature is distinctive from many other gases and allows MOFs, through their arrangement of atoms, to be selective. Hupp is uncertain that MOFs will easily be applied to the steamy industrial environment of the coal plant. "I think it's conceivable, but I'm not so sure," he said. Wang thinks he has a molecule that will be ready to scale up to industrial levels in an affordable way. Already, Yaghi's lab has partnered with the chemical giant BASF SE to mass-produce three simple MOFs, called Basolite, which are used to absorb a wide range of chemicals. 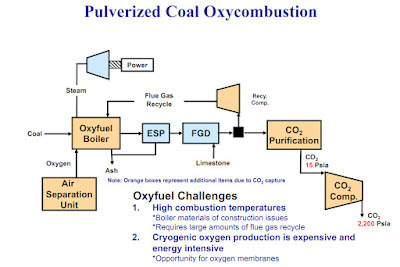 Oxy-fuel Combustion - Involves the combustion of fuel in an oxygen-rich environment to dramatically increase the CO2 concentration of the resulting flue gases. The increased CO2 concentration (typically >80%) of the flue gas stream facilitates CO2 separation. Oxyfiring produces lower emissions of nitrogen oxides (NOx) compared to air-blown combustion. After combustion, the flue gas can be capture and compressed, although some cleaning to remove contaminants may be necessary before compression. An air separation unit supplies oxygen to the boiler where it mixes with the recycled exhaust gas. After combustion, the gas stream can be cleaned of PM, nitrogen oxides, and sulfur. After condensing out the water, the flue gas has a CO2 concentration that is high enough to allow direct compression. 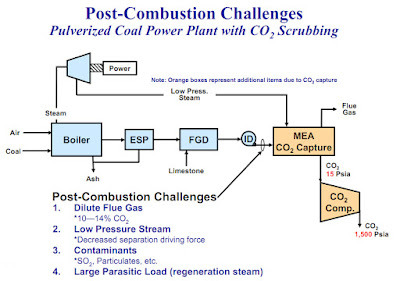 However, the compressed flue gas may have to be further cleaned of co-constituents to reach the same purity as the compressed CO2 resulting from post-combustion capture. As of 2008, oxy-fuel power plants are in the early stages of development with pilot-scale construction currently underway in Europe and in North America. Pre-combustion Capture - The generation of syngas (carbon monoxide plus hydrogen (CO+H2)),followed by the shift reactions to convert the CO to CO2. CO2 is then separated from hydrogen, and the hydrogen can be burned in a turbine or used as fuel in a heater. 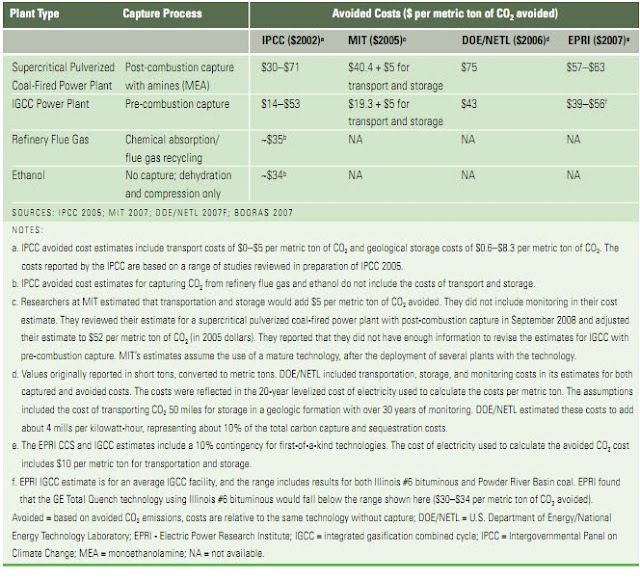 Pre-combustion capture is often associated with integrated gasification combined cycle (IGCC) technology; however, post-combustion capture technologies can also be applied to IGCC. Most studies suggest it is more cost-effective to use pre-combustion technologies with IGCC because the CO2 can be captured at higher pressures compared to post combustion. The first step involves gasifying the coal. Then, a water-gas shift reactor is used to convert carbon monoxide in the syngas and steam to CO2 and hydrogen. This increases the concentration of CO2, improving CO2 capture efficiency and increasing the amount of carbon (in the form of CO2) that can be removed using this process. The CO2 is removed using either a chemical or a physical solvent, such as Selexol™ , and is compressed. The hydrogen is combusted in a turbine to generate electricity. Post-combustion Capture - The separation of CO2 from the flue gas of a combustion process. Fuel sources can be any hydrocarbon, such as coal, natural gas, or oil. 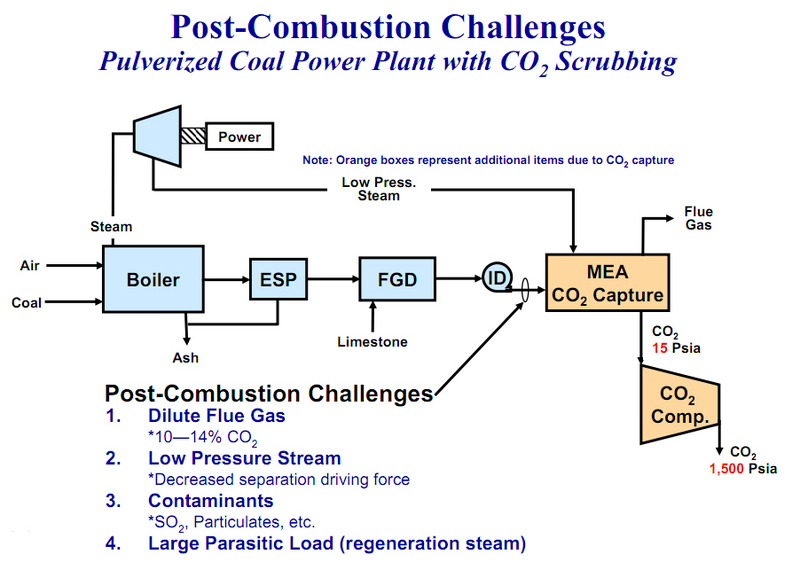 For coal plants, post-combustion capture is typically associated with subcritical pulverized coal (PC), SCPC, ultra-supercritical pulverized coal (USCPC), and circulating fluidized bed (CFB) plants. from the other flue gas components and concentrate the CO2) and a compression system (to compress the CO2 and prepare it for transport). Leading post-combustion capture technologies also require significant cleaning of the flue gas before the capture device. In particular, sulfur levels have to be low (less than 10 parts per million (ppm) and possibly lower) to reduce corrosion and fouling of the system.
) and a device that removes particulate matter (PM). The diagram shows the use of limestone slurry for this purpose, suggesting use of wet flue gas desulphurization (FGD). While wet FGD would not be a required component, it might be needed to reduce the sulfur content to the required level. Also, note that the flue gas cleanup area would include a device for PM collection. The flue gas then enters an absorption column (represented by the CO2capture box) that contains the amine solution. As the flue gas contacts the amine in the absorption column, the CO2 is absorbed into the amine solution. The flue gas then exits the stack, and the amine solution is sent to a stripping column, where the CO2is removed from the amine solution through an increase in the solution temperature. The amine is recycled and sent to the absorption tower, while the CO2is cooled, dried, and compressed to a supercritical fluid. Pulverized Coal Power Plants - Power plants that generate electricity by injecting finely-ground coal through burners into a furnace for combustion. Pulverized coal power plants are broken down into three categories; subcritical pulverized coal (SubCPC) plants, supercritical pulverized coal (SCPC) plants, and ultra-supercritical pulverized coal (USCPC) plants. The primary difference between the three types of pulverized coal boilers are the operating temperatures and pressures. Subcritical plants operate below the critical point of water (647.096 K and 22.064 MPa). Supercritical and ultra-supercritical plants operate above the critical point. As the pressures and temperatures increase, so does the operating efficiency. Subcritical plants are at about 37%, supercriticals at about 40% and ultra-supercriticals in the 42-45% range. Subcritical PC units are the least efficient, and typically operate at about 1,000°F and 2,400 pounds per square inch (psi). Supercritical PC units are the next most efficient, and operate at around 1,050°F and 3,500 psi. Ultra-supercritical PC units are the most efficient, and operate above 1,200°F and 5,000 psi. The majority of existing PC units in the United States are subcritical. Ultra-supercritical units require advance materials and have been successfully constructed and operated in Europe and Japan. Slip-stream capture - The capture of a portion of a process or exhaust stream instead of the entire stream. Slip-stream capture is particularly useful in demonstration projects where the entire process or exhaust stream would be too large for the demonstration device to control. Solvent Approach - To capture the carbon dioxide generated by coal plants, chemical companies like Dow Chemical Co. and energy giants like Alstom SA have been betting big on liquid solvents like amine. Problem is, once the two are bound, they never want to part. The energy needed to separate amines from CO2 can take up to 25 percent of the energy generated by a coal plant. The scale-up from lab to coal plant is easier with liquids, which explains much of the attraction of amines and Selexol, a solvent that will likely be used to capture CO2 in coal plants designed from the ground up for carbon capture. DOE estimates that the cost of electricity produced from plants using Selexol will increase by 30 percent. Sonochemistry - The application of ultrasonic energy forces dissolved CO2 into gas bubbles. Ultrasound is being tested combined with the bio- catalyst, carbonic anhydrase for reducing the energy required to remove the captured CO2 from the solvent. Sorbent Approach - Absorbents and adsorbents, referred to as “sorbents,” are used in environmental, industrial, agricultural, medical, and scientific applications to retain liquids and gases. Absorbents incorporate substances throughout the body of the absorbing material, while adsorbents gather substances over the surface of the material. Thermal Swing Regeneration - Requires significant power to heat, boil and cool harsh chemical sorbents in a series of steps to remove the CO2 from the flue gas. Deployment of CCS on an industrial scale will require research to reduce the cost and improve the performance of capture technologies and a policy driver to reduce CO2 emissions. DOE has established a goal for CO2 capture of 90% at an increase in cost of energy services of less than 20% for post-combustion (such as MEA) and oxy-fuel combustion, and less than 10% for pre-combustion capture. 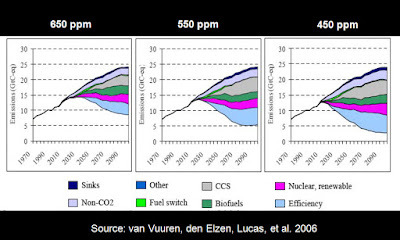 The timeline for DOE’s capture research is to demonstrate a series of cost-effective CO2 capture technologies at pilot scale by 2012. CCS is an essential element in a portfolio of approaches for reducing CO2 emissions because it is deployable and there is an enormous amount of potential storage capacity located around the world. To make significant reductions in greenhouse gas (GHG) emissions by mid-century, large-scale reduction opportunities, including CCS, will be needed. Cost - CCS is expensive. 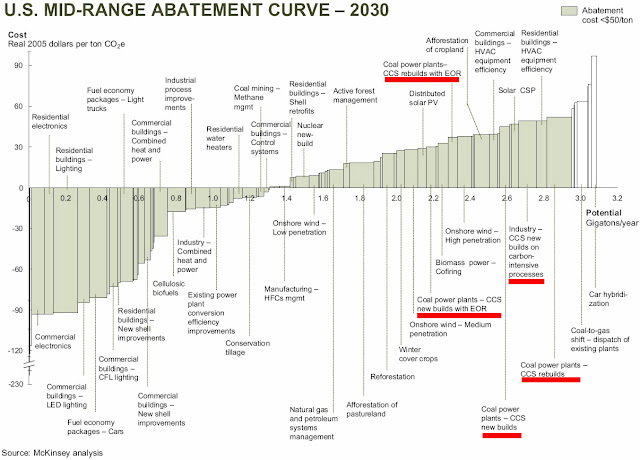 Estimates published by Belfer Center for Science and International Affairs, Harvard Kennedy School, July 2009 find representative range of costs of abatement for capture (and excluding transport and storage) appears to be $100-150/tCO2 for first-of-a-kind (FOAK) plants and plausibly $30-50/tCO2 for nth-of-a-kind (NOAK) plants. For FOAK plant using solid fuels the levelised cost of electricity on a 2008 basis is approximately 10¢/kWh higher with capture than for conventional plants (with a range of 8-12 ¢/kWh). 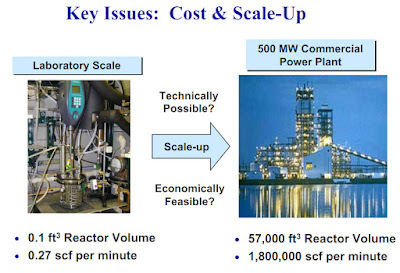 For NOAK plants, the additional cost of electricity with capture is approximately 2-5¢/kWh. These estimates are mainly based on cost data from 2008, which was at the end of a period of sustained escalation in the costs of power generation plant and other large capital projects. There are now indications of costs falling from these levels. This may reduce the costs of abatement and costs presented here may be "peak of the market" estimates. 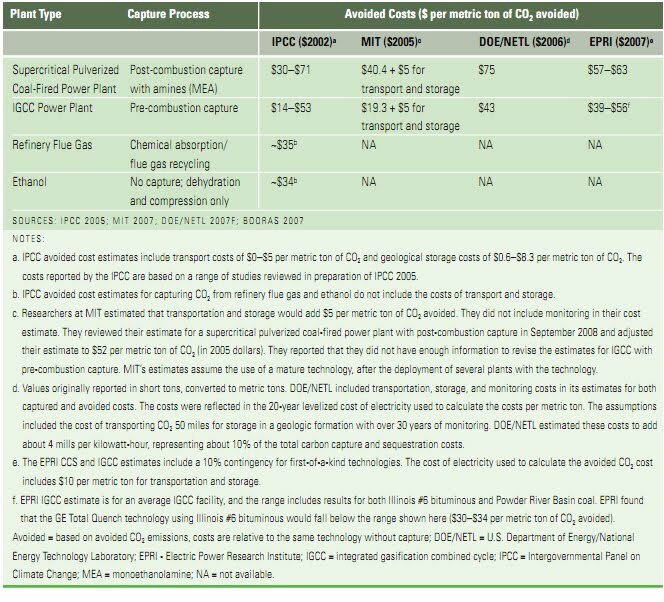 If general cost levels return, for example, to those prevailing in 2005 to 2006, then costs of capture and compression for FOAK plants are expected to be $110/tCO2 avoided (with a range of $90-135/tCO2 avoided). 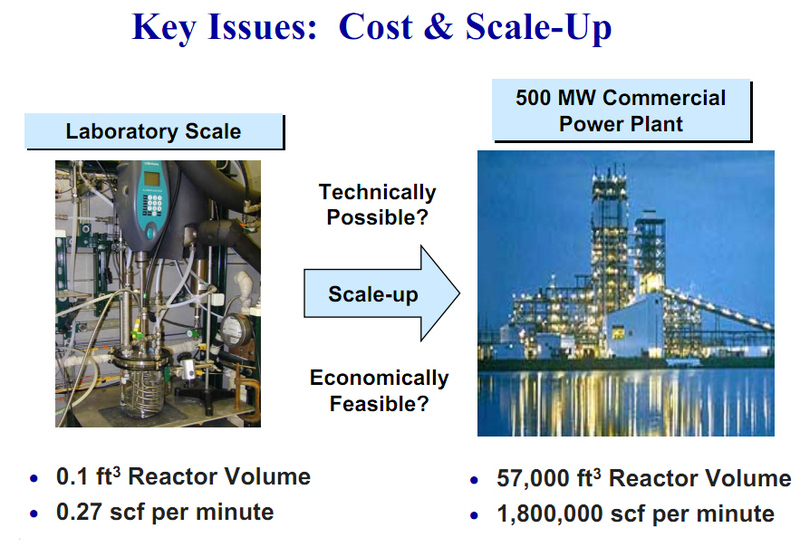 For NOAK plants costs are expected to be $25-50/tCO2. Cost reductions are expected from increasing scale, learning on individual components, and technological innovation including improved plant integration. Innovation and integration can both lower costs and increase net output with a given cost base. These factors are expected to reduce abatement costs by approximately 65% by 2030. Operating vs. Laboratory Conditions. - The environment of the coal plant is harsh. The types of experiments and setups that are used in the laboratory to determine reaction rates and particle properties often do not translate directly into large-scale equipment. Co-Constituents - When CO2 is captured from power plants, it contains water. When combined with water, CO2 forms carbonic acid that has the potential to corrode pipelines (it is possible, but significantly more expensive, to construct pipelines that are resistant to this corrosion). The captured CO2 can also contain hydrogen sulfide (H2S). Facility operators will have to dry the CO2, remove co-constituents, and compress it into a supercritical phase before it leaves the facility. Demonstrations of all capture approaches (pre-combustion, post-combustion and oxy-fuel combustion) are urgently needed on commercial-scale power plants to prove the technologies. There should be recognition of the potential challenges in achieving the theoretical maximum capture potential before the technologies are proven at scale. This may necessitate flexibility in establishing appropriate capture rates for early commercial-scale projects with the amount of CO2 captured at a facility dependent on both technology performance and the specific goals of the project. Standards for the levels of co-constituents have been proposed by some regulators and legislators; however, there is potential risk that this could create disincentives for reducing sources of anthropogenic CO2 if the standard is set too stringently. Ultimately,the emphasis should be on employing materials, procedures, and processes that are fit-for-purpose and assessing the environmental impacts of any co-constituents, along with the benefits of CO2 emissions reduction, as part of a comprehensive CCS risk assessment. Facility operators, regulators, and other stakeholders should pay particular attention to potential impacts of co-constituents in the transport and storage aspects of the project. FutureGen - Initiative launched by the U.S. Department of Energy (DOE) in 2003 to build a 275-megawatt integrated gasification combined-cycle (IGCC) carbon dioxide capture and storage (CCS) plant. DOE announced a restructuring of the FutureGen approach in January 2008, proposing to use federal funding to demonstrate CCS technology at multiple commercial-scale IGCC or advanced coal power plants, in lieu of a single demonstration, mostly due to higher than expected costs. In June 2008, the government announced a call for proposals to elicit commercial involvement in the restructuring. In March 2009, Congressional auditors determined that the DOE had miscalculated the government portion of the project's cost, overstating the amount by a half billion dollars. As a result, the Bush administration cited the project as having nearly doubled in cost when, in reality, it had increased by 39%. FutureGen 2.0 - In August 2010, the DOE announced a retooling of the FutureGen project, dubbed FutureGen 2.0. The revised plan includes retrofitting a shuttered coal-fired power plant in Meredosia, Illinois to demonstrate advanced oxy-combustion technology, and piping the carbon dioxide 175 miles to Mattoon for underground storage. Due to these changes, leaders in Mattoon decided to drop out of the FutureGen project. In February 2011, Morgan County was chosen for the sequestration site. Construction on the power plant and carbon dioxide storage site is expected for spring 2013. The Sleipner Project, the longest-running large-scale CCS project in the world, began capturing CO2 from natural gas processing off the coast of Norway in 1996. During natural gas processing, CO2 naturally present in a natural gas stream is stripped from produced natural gas in order to increase the purity for delivery into the market. In many other plants, this stripped CO2 is vented to the atmosphere. At Sleipner, the CO2 is captured using a conventional amine capture process, and is then stored in a saline reservoir under the North Sea. 250 MW Buggenum IGCC plant in The Netherlands. It also has good availability. This coal-based IGCC plant currently uses about 30% biomass as a supplemental feedstock. The owner, NUON, is paid an incentive fee by the government to use the biomass. NUON is constructing a 1,300 MW IGCC plant in the Netherlands. The Nuon Magnum IGCC power plant will be commissioned in 2011. Mitsubishi Heavy Industries has been awarded to construct the power plant. Here is a list of the projects selected for negotiation of award, from the DOE website: . B&W PGG - Babcock & Wilcox Power Generation Group - Barberton, Ohio - A subsidiary of McDermott International, Inc. 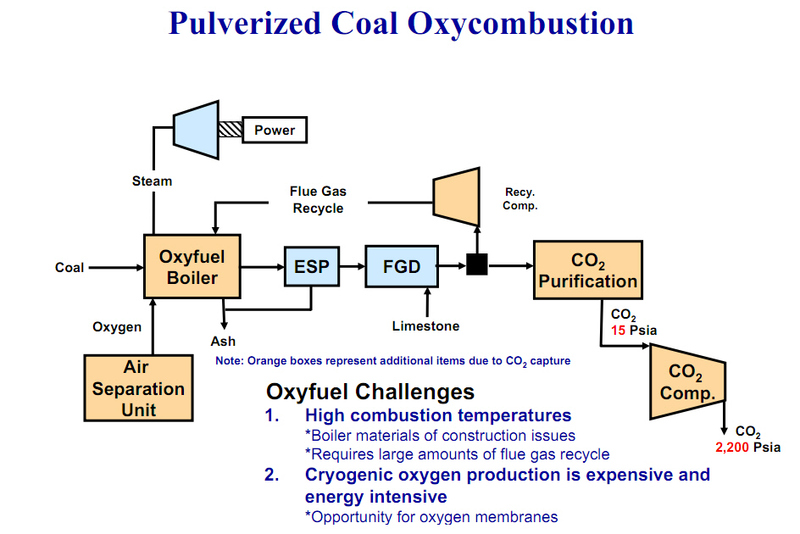 In March 2010, B&W PGG and Fluor Corporation formed a strategic alliance to market and sell carbon dioxide (CO2) capture systems for existing coal-fired power plants in the United States and Canada. Battelle (PNNL - Pacific Northwest National Lab) - Richland, WA - A DOE of Science national laboratory where interdisciplinary teams advance science and technology and deliver solutions to America's most intractable problems in energy, the environment and national security. PNNL employs 4,900 staff, has an annual budget of nearly $1.1 billion, and has been managed by Ohio-based Battelle since the lab's inception in 1965. FutureGen Industrial Alliance - Structured as a non-profit (501(c)(3)) organization in order to focus on technology advancement rather than profits. Alliance members contributing to the project do not receive any direct financial returns from participation in FutureGen. All revenue from the sale of any marketable byproducts will be returned to the non-profit. The process starts with a pure liquid aminosilicone reacting with the CO2 in the flue gas and forming a solid with an increased CO2 capacity compared to the current co-solvent approach. This solid is then transported to a closed chamber where it is heated to release the CO2. The advantage of the solid is that the CO2 can be released under pressure, which minimizes the need for compression. When the CO2 is released, the liquid aminosilicone is formed again and recycled back to the stack for further reaction with more flue gas. This process has the potential for an additional decrease in the cost of electricity (COE). However, solids handling has the potential for being more complex than movement of liquids and as such has a higher risk associated with it. Membranes are physical barriers that let some gases penetrate through them much faster than other gases. The membranes being developing have small holes that approach the size of the molecules. These pores tend to let smaller molecules through more rapidly. With proper nanoengineering of the molecular structure to favor selective adsorption and surface transport along the pore walls, membranes can be produced that favor larger molecules over smaller ones. GE is currently working in the lab on minimizing performance degradation over long periods of time as well as making membrane units large enough to handle CO2 at the scales produced by a power plant. The proposed project will use a post combustion capture technology incorporating BASF’s novel amine-based process at a 1 MWe equivalent slipstream pilot plant at the National Carbon Capture Center. This technology offers significant benefits as it aims to reduce the regeneration energy requirements using novel solvents that are stable under the coal-fired power plant feed gas conditions. DOE will contribute $15,000,000 to the project. Membrane Technology and Research, Inc. - Menlo Park, CA - This project will focus on novel membrane designs that will result in reductions in membrane cost, system complexity, footprint, and pressure drop for very large membrane-based CO2 capture projects. A commercial-scale membrane module will be developed with an area of 2,500 m2, which is 20 to 50 times larger than the area of current modules. The cost and complexity of manifolding the membrane modules and the footprint of the membrane system can be sharply reduced by development of the new mega-modules. Energy savings due to low pressure drops for gases circulated through the modules, as well as improved countercurrent flow, are additional benefits. (DOE share: $2,999,871; recipient share: $983,202. Membrane Technology and Research (MTR) and partners will construct a membrane skid capable of 90% CO2 capture from a 20 tons-of-CO2/day slipstream of coal fired flue gas (equivalent to the CO2 generated by 1 MW of power generation). The skid will be operated during a 6 month field test at Arizona Public Service’s Cholla power plant and will utilize MTR’s Polaris membranes. Test data from the skid will be used to clarify the relative potential of membrane-based CO2 capture from power plant flue gas. Other collaborators on this 3 year DOE project include the Electric Power Research Institute, Southern Company, and Babcock & Wilcox. This project, located at the Colorado Springs Drake #7 power plant, will design, construct, and test a patented NeuStreamTM absorber. The absorber will use nozzle technology proven during a recently completed 20 megawatt NeuStream-S flue gas desulfurization pilot project, and an advanced solvent that efficiently captures CO2. This absorber technology is applicable to a variety of solvents and can be added to existing pulverized coal power plants with reduced cost and footprint. Because of the modularity of the NeuStream technology, it can be rapidly scaled to larger size systems and retrofitted into existing plants with little risk. DOE will contribute $7,165,423 to the project. Southern Company will develop viable heat integration methods for the capture of CO2 produced from pulverized coal combustion using a waste heat recovery technology, High Efficiency System. This technology will be integrated into an existing 25 megawatt pilot amine-based CO2 capture process (KM-CDR) at Southern Company’s Plant Barry. Modeling by Mitsubishi Heavy Industries America indicates that a fully heat integrated High Efficiency System will improve by 26 percent the thermal energy performance of the integrated KM-CDR and plant operation. DOE will contribute $15,000,000 to the project. TDA Research, Inc. - Wheat Ridge, CO - Has proposed using a proprietary form of activated carbon for capturing CO2 Typically, activated carbon, which is hugely porous -- 1 gram contains almost the surface area of a basketball court -- is used to absorb poisons and in groundwater remediation or sewage treatment. The carbon developed by Steven Dietz, a researcher at TDA, has two different sizes of pores, which he calls mesopores and micropores. The larger mesopores act as channels to the micropores, greatly increasing the rate at which TDA's carbon absorbs CO2, compared to activated carbon. Most activated carbon is derived from "carbonized" -- or burnt up -- plants like coconut shells, which still limits one to the plant's structure, Dietz said. TDA can now develop activated carbon from sugars, which means there is less junk floating around the compound. It is essentially synthetic. 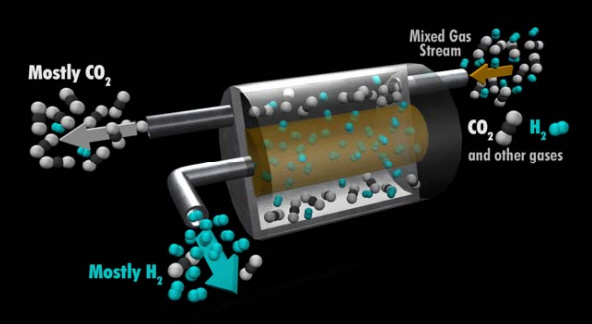 Researchers plan to use an innovative heat integration method that uses waste heat from a Hitachi H3-1 advanced solvent carbon capture system while improving steam turbine efficiency. The proposed process also implements a process concept (working with the heat integration method) that increases solvent capacity and capture rate in the CO2 scrubber. The novel concepts and advanced solvent used in this study will significantly improve the overall plant efficiency when integrated with CO2 capture systems, and can be applied to existing coal-fired power plants. DOE will contribute $14,502,144 to the project. In April 2012, the UK re-launched a £1 billion ($1.6 billion) competition to promote the large-scale adoption of carbon-capture technology, an investment that government officials hope will make the UK a global leader in the emerging low-carbon energy sector. Launched by the Department of Energy and Climate Change (DECC), the program will offer funding for the development of one or more plants capable of removing carbon emissions from coal-fired power plants and storing them underground. While some call such so-called carbon capture and storage (CCS) technology a potentially critical part of reducing atmospheric levels of carbon dioxide, the sector remains unproven and costly at a large scale. Ed Davey, secretary of the DECC, predicted that the sector could be worth £6.5 billion annually to the UK by the end of the 2020s and become operational at 12 to 20 large power plants, producing up to 30 gigawatts of power. An earlier CCS competition in the UK faltered last year when the final bidder withdrew because of disagreements over how much government funding would be needed. Al-Juaied, Mohammed and Adam Whitmore. "Realistic Costs of Carbon Capture." Discussion Paper 2009-08, Energy Technology Innovation Research Group, Belfer Center for Science and International Affairs, Harvard Kennedy School, July 2009.